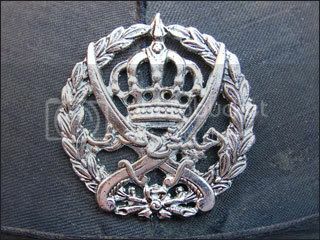 A black cloth covered cork helmet, as used by the Jordanian Army in the 1950s and 1960s. 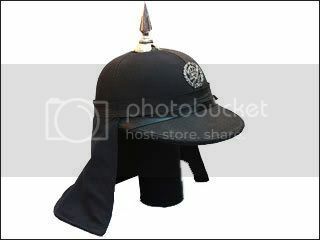 This is the same basic style helmet, made by the British uniform maker Hobson & Sons of London, which was used by the Arab Legion -- which merged with the Jordanian Nation Guard to form the Jordanian Army in 1956. 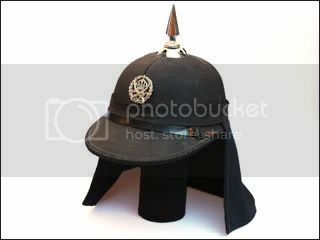 This cork sun helmet was likely based on the British polo helmets. A period photo from 1950 shows King Abdullah (right), the first king of Jordan, standing next to his son Talal, who ruled briefly after Abdullah's assassination in 1951. Talal was deposed in 1952 and succeeded by his son Hussein. 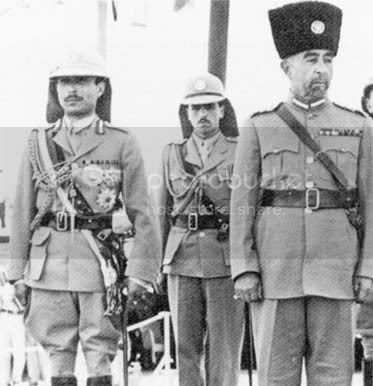 Note that Talal is wearing the ceremonanial helmet of the Arab Legion.